Mail supports most popular mail services, including Gmail, Yahoo! Mail and any account that supports POP or IMAP. 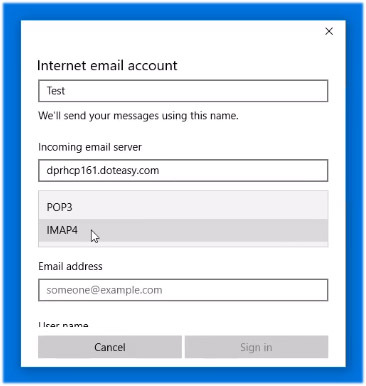 In other words, you can setup your Windows 10 Mail application to access your domain email accounts. 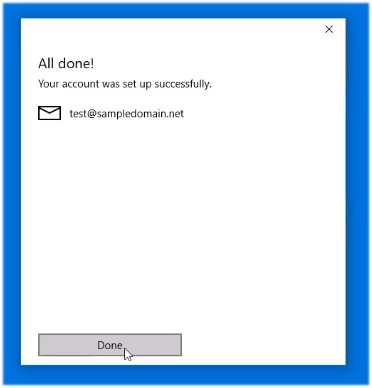 In this article, we will show you how to configure your Windows 10 Mail app to access your domain email account(s). 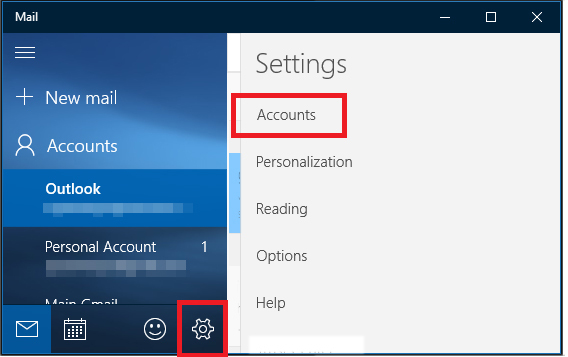 There are two ways to add an email account in Windows 10 Mail. If this is the first time you’ve setup mail, you will get a Welcome window inviting you to add an email account. If mail has already been setup, you will have access to the mail settings options and create a new email account. Click on Add Account on the Welcome window. 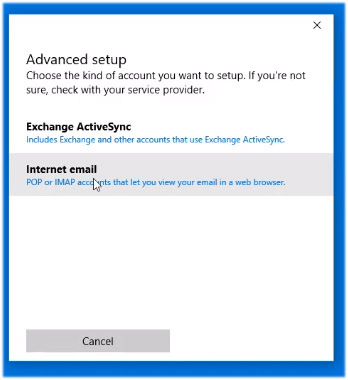 If you have already setup Windows 10 Mail to access another email account, you will not see the Welcome window. If this is the case, simply click on the Settings icon in the lower left-hand corner of the app and select Accounts from the right menu. 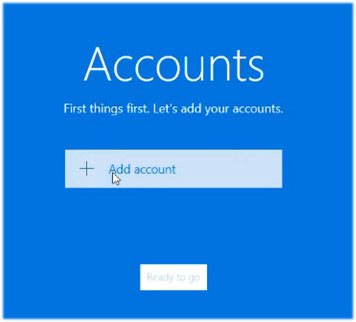 On the Accounts window, select + Add Account. 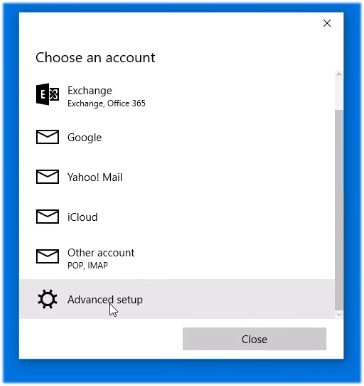 On the Choose an account window, select Advanced setup. On the Advanced setup window, select Internet email. By default, the four checkboxes at the bottom of the account settings window will be checked. You can simply leave the first two options checked. 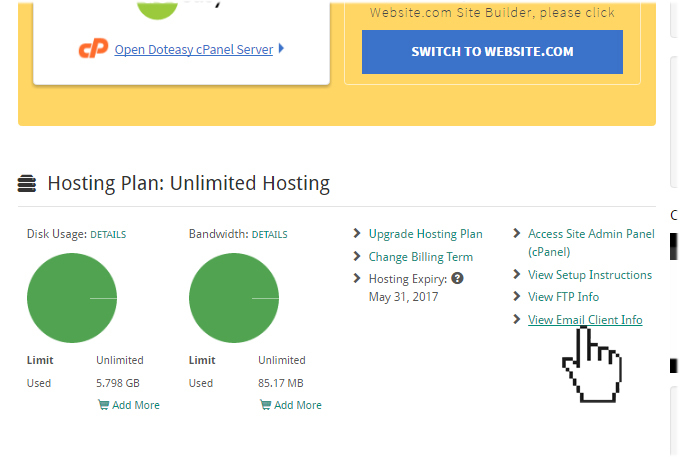 For the last two options, Require SSL for incoming email and Required SSL for outgoing email, if you are currently on the Doteasy SmarterMail platform, you do not have the Secure SSL option. If this is the case, you will need to uncheck the last two checkboxes. 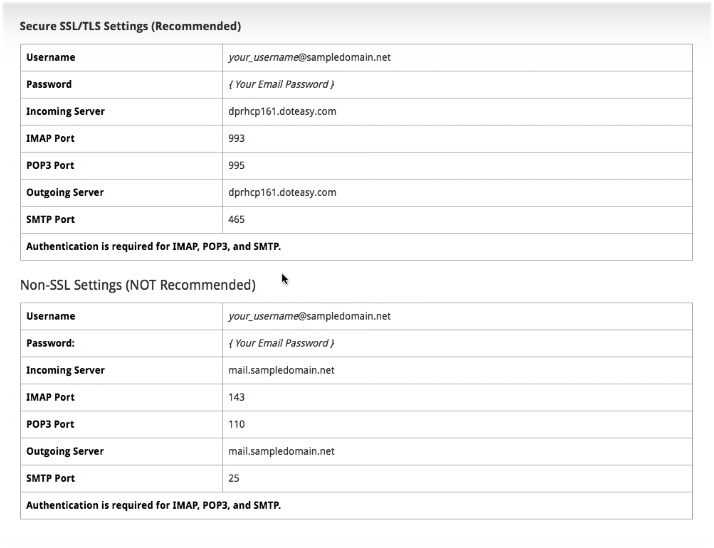 If you are on the cPanel mail platform and you have opted to use the Secure SSL settings information in your View Email Client Info panel, then you can leave the last two checkboxes checked. If you have entered all information correctly, you will see the All Done! confirmation window. 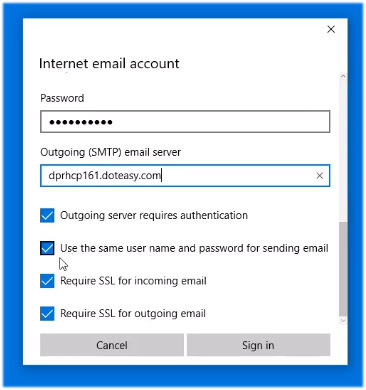 This means your Windows 10 Mail app is now configured to access your Doteasy domain email account. 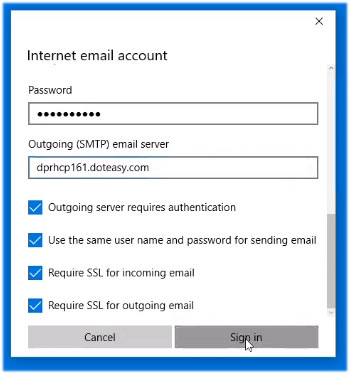 If you want to use Windows 10 Mail to access another domain email account, simply click on the Settings icon in the lower left-hand corner of the app and select Accounts from the right menu and follow Steps 2 to 8 to add a new domain email account to the Windows 10 Mail app. This completes the Windows 10 Mail configuration process. If you have any questions about this article or our video tutorial, or if you should run into any problems, please do not hesitate to contact us. You can reach us by email, phone and live chat. We also offer a call back service.